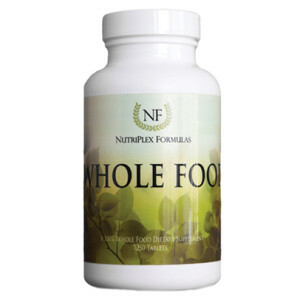 For those who have been searching for an all-in-one nourishing, nutrient-rich “multi” supplement, Whole Food is the answer! Packed with healthy, rich and complex foods, this formula is ideal for general health and is used everywhere by the body — from organs to tissues to glands. Whole Food is an essential part of a daily health regimen. Chock full of essential vitamins and nutrients, it serves to offset many of the enervating effects of the Typical Modern Diet. Excellent for a multivitamin, multi-mineral & protein supply, immune system, nutritional deficiencies, & more! Inactive Ingredients: Microcrystalline Cellulose, Hydroxypropyl Cellulose, Croscarmellose Sodium and Silica. In addition to the unique properties, synergists and cofactors of this food, each serving provides the following nutrients contained within the above food-nutrient blend (not as isolates): Vitamin A, Vitamin B, Vitamin C, Vitamin D, Vitamin E, Essential Fatty Acids, Sulfur, Iron, Potassium, Calcium, Magnesium, Manganese, Selenium, Zinc, Phosphorus, Copper, Antioxidants, Bioflavonoids, Trace Mineral Activators, Enzymes, Chlorophyll, Amino Acids, Whole Proteins, Carotenoids, Phytoestrogens and more. 4 tablets or 1/2 tsp. powder daily, or as directed by a healthcare practitioner. Whole Food is considered a “multivitamin, multi-mineral” supplement, but in a live, enzyme-containing FOOD complex form rather than as a group of dead isolates. Many current multi-vitamin supplements contain lists of isolates (names of vitamins and minerals instead of names of foods), even if they call themselves “natural.” Whole Food is far superior to these multi-vitamins! As a food concentrate, Whole Food contains complete vitamin, mineral, amino acid and essential fatty acid complexes needed by multiple physiological and biochemical functions. The general health, including but not limited immune system function, tissue repair and musculoskeletal health, depends upon live-food nutrients for cellular growth, mobility, immunity and reproduction needed systemically for physiological function. Due to many problematic deficiencies in the modern, devitalized, processed-foods lifestyle, Whole Food is an ideal supplement to restore real, raw nutrients to the diet. This product is used both in detoxification, juice fasting and wellness regimens. The powder form of Whole Food may be added to any juice, smoothie or health drink.